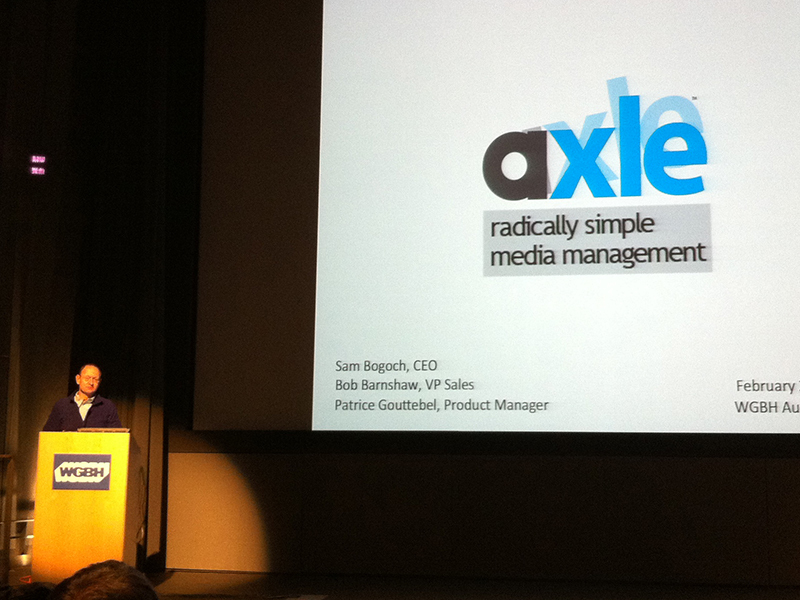 The Axle Video media asset management system. Last week I attended the Boston Avid Users Group February meeting. The meeting was held in the Yawkey Auditorium at WGBH. In addition to seeing and talking to a lot of great editors from the New England community, Axle Video showed off their Media Asset Management (MAM) system. This MAM is just what smaller post production facilities have been waiting for. A system that catalogs and keeps track of all of your project media, without costing more than your editing suite. 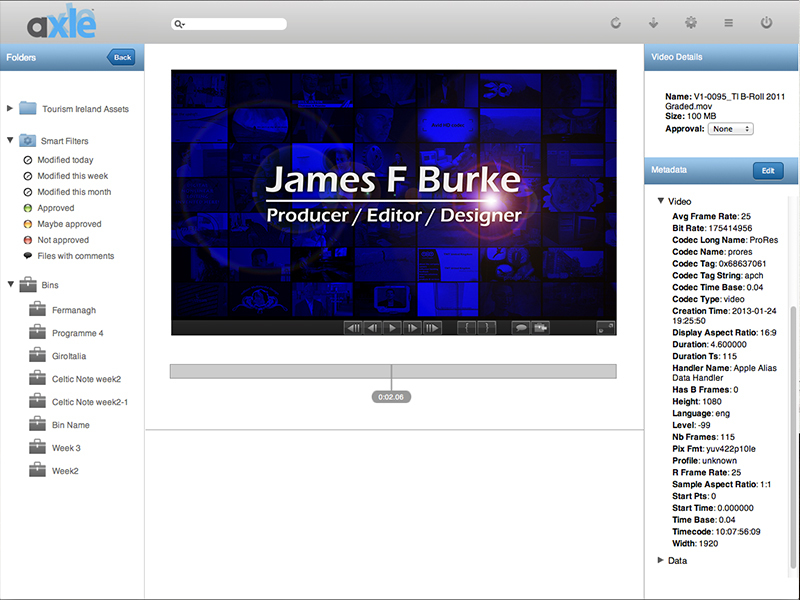 The system, which is web-based, lives on a Mac-mini (the most affordable Macintosh computer) and automatically indexes all new media as it is added to your media volumes. One of the key points that was made during the demo, is that the system tracks all of the media without interfering with it. That means that if the Axle system goes down, it has no affect on the media, and users can continue working without interruption. The Axle Video MAM interface. The interface is very clean and intuitive. It is meant to be up and running with very little set-up or learning time needed. This MAM is non-destructive and never alters the actual media files or their location. Any metadata that is added can travel with the media by way of a sidecar file. In addition to its power to catalog and search all of your media, I think a huge selling point will be it's review and approval capabilities. The video proxies it creates are hi-quality and can be scrubbed, marked with comments and sub-clipped. Since it is web-based, a client can be given access to the clips from anywhere, using any device. 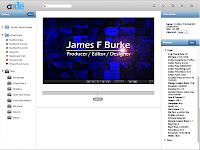 Currently the annotations added to the clips can be sent back to Final Cut Pro and Adobe Premiere Pro with plans to push the information to the Avid Media Composer as well. Currently the system will not catalog Avid proprietary media files, and anyone who uses an Avid system will understand the complexity of this. With Avid, the media for a standard clip with video and two channels of audio is saved as three elementary streams - a video file and two audio files. The container that wraps these files together is the clip which is saved in Avid's bin document (for an explanation of containers, see HTML5 for Your Video Clips). Not to fear, there are plans to support Avid media files in a future release. Until then, it will work just fine with your Avid AMA-sourced media. This media asset management system looks like it will be a big hit with post production facilities of all sizes. I look forward to hearing about the buzz they create at this year's NAB.